Volunteers sort donations into food categories before making up boxes for those in need. Hopetoun Farm Shop recently made a sizable donation of non-perishable foods to West Lothian Food Bank‘s main depot in Livingston after hearing about their appeals for extra food donations. 1 in 5 people live below the poverty line in the UK and people in West Lothian are going hungry every day. 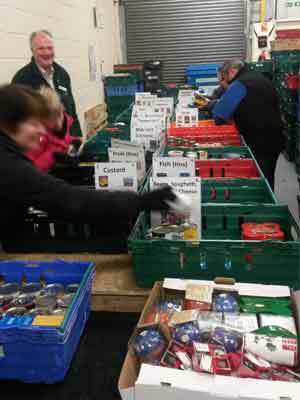 The food bank provides 3 days of nutritionally balanced emergency food to local people in crisis. All recipients are referred to the food bank by front line care professionals such as doctors, health visitors, social workers, CAB and police who then issue them with a food bank voucher. Recipients bring their voucher to the food bank centre where it can be redeemed for three days emergency food. They can also meet with volunteers over a cup of tea or free hot meal and advice can be given on other agencies able to solve the longer-term problem. 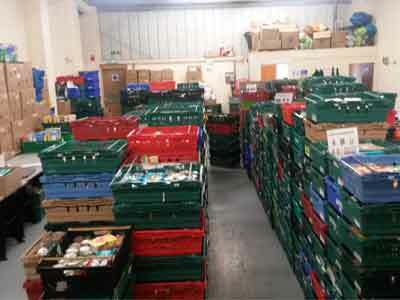 The food bank also runs a rural delivery service, which takes emergency food boxes to clients living in rural areas who cannot afford to get to a food bank. The total amount of stock donated by Hopetoun Farm Shop weighed approximately 150kg which equates to 364 meals for those in crisis.